I met up with an author friend of mine for lunch in San Leandro. We went to Luke’s Grill for Greek Food. I started with a glass of retsina, a traditional white wine with the unique scent and taste of pine resin. Originally distributed in amphora sealed with resin, the wine now is either aged in pine barrels or has actually pieces of pine resin added during fermentation. I love the taste and the glass I had was quite delicious. Our appetizers were the tsatziki with warm pita. I love this yogurt garlic dip and ate most of it myself. We also got the saganaki, a goat cheese that they flambe at the table. Very fun (what can beat cheese AND fire?) and incredibly tasty, too. 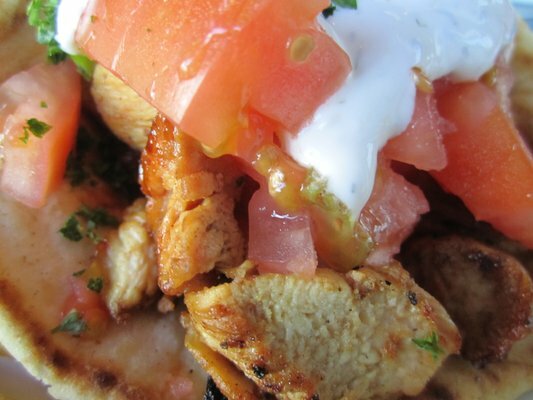 For the meal, I had the souvlaki in pita with chicken. Well seasoned meat with veggies and more of the tsatziki. It was served with french fries that were a little overcooked but tasted very good dipped in the leftover appetizer tsatziki. My dining companion had the spanakopita, a spinach and cheese filled pastry. She seemed to enjoy it but I’m not a fan of cooked spinach, so I didn’t try any. The wait staff is very friendly and quick to answer questions. We also arrived right after a large group and they snuck our orders in first so we didn’t have to wait forever. 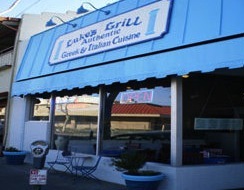 Luke’s Grill remains my go to place for Greek while visiting Northern California.